It was here that speeches were given by the Mayor of Péronne, Thérèse Dheygers and Managing Director at Ryebuck Media, Tim Gurry OAM. As both teams were presented their jumpers, the captains for both sides were announced. For The ANZACs, Hamburg Dockers star and coach Pete Richter was given the honour of leading the men in white out to the ground for the contest. For The Liberators, Brad Agnew from the Glenelg Tigers in the South Australian Football League was selected to skipper the men in red. Arriving at the ground that once made up the battlefields of Somme territory on Saturday, players were firstly involved in a kids clinic with local children from the area. Teaching kids the unique code while emphasising just how fun the sport can be to play, players set up goal-kicking, handball and marking stations to ensure the little legends were exposed to all the skills of the game. The clinic was an emphatic success as the game continued to capture the hearts of young ones around the continent. After the clinic, the talented local Pipe Band performed as part of the pre-match entertainment, before the attention of the spectators was taken away by a couple of individuals floating high up in the sky. 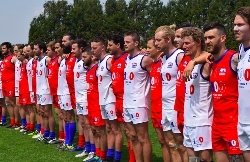 Two parachutists with one carrying a French flag and one carrying an Australian flag made their way onto the deck before the national anthems were belted out by both sets of players. 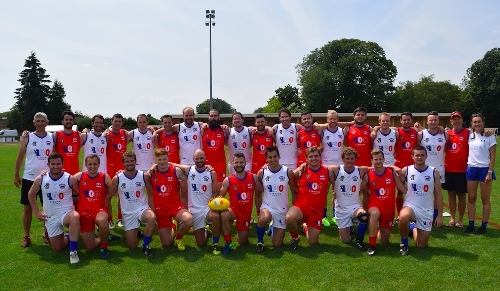 In a mark of respect, both teams agreed to take a joint photo together and just minutes later the game was underway. It was The ANZACs who got off to a quick start in the French town as they quickly escaped away to a two-goal lead minutes into the opening term. Threatening to break the game open, it was The ANZACs who looked the goods early before The Liberators found their way back into the contest. Repeated efforts from Brad Agnew and Adrian Del Campo were instrumental in the side’s recovery in the backend of the first quarter. At the first change, it was the ANZACs by just one point and the game was on for young and old. Coming into the second term, The ANZACs once again looked to capitalise on a slow start from The Liberators.With many targets down forward, it was Ben Polmear who seemed to be the biggest concern for The Liberators defence as he became The ANZACs first multiple goal-scorer. It was his side that took control in this quarter and gave themselves a 16-point lead heading into the main break. Needing a response after half time, The Liberators managed to keep The ANZACs goalless in the third term. Having six shots at goal themselves, The Liberators failed to capitalise on multiple chances to take the lead as they kicked 2.4 in ‘The Premiership Quarter’ to trail by just two points at the final change. In a tight and tense final quarter, both teams had chances to break the game open but the scores still remained extremely tight throughout the duration of the quarter. After The Liberators kicked a goal with just under a minute to go in the contest, The ANZACs were on the canvas and their lead was in severe trouble, but the men in white just held on. The final margin was a slender five-points in a cracking game of Australian Football proudly honouring the occasion at hand. The ANZACs: Ben Polmear (3), Alex Pictrus, Tate Gladresco, Pete Richter, Pierre Lechasles, Ryan Davey. The Liberators: Tyson Vitale (3), Broadie Borg (2), Brad Agnew (2), Adrian Del Campo.